Cinco de Mayo has become an increasingly important marketing opportunity for many brands, as evidenced by two of this year’s ambitious promotions. 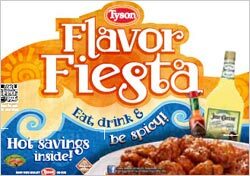 Tyson Foods, Tabasco brand and Jose Cuervo’s nonalcoholic margarita mix have teamed on a “Fiesta of Flavor” retail savings promotion that will kick off in time for Cinco de Mayo parties and extend into early summer. Between April 30 and June 29, consumers can use in-store coupons to get $1 off two pounds or more of Tyson Wings or Boneless Wings (sold in the deli section), 75 cents off a bottle of Tabasco’s new Buffalo Style Hot Sauce (or other Pepper Sauce flavor), and 75 cents off a bottle of the Cuervo margarita mix. The retail promotion will be supported through Tyson’s DeliAnytime Facebook page. In addition to offering coupons to those who register/”like” the page, Tyson will offer a live-chat session on May 3 with its Deli Meal blogger, “Lisa,” who will offer Cinco de Mayo party tips. Dos Equis -– no stranger to Cinco de Mayo campaigns -- is marking the holiday’s 150th anniversary this year with an expanded effort supported by significantly increased media investment. “The Lost Art of Cinco” campaign ties in with the brand’s Most Interesting Man in the World character, who has (of course) mastered the “lost arts and rituals” of the holiday. Media efforts will support in-store promotions including a variety of Dos Equis display-enhancers, such as “standees” featuring The Most Interesting Man. In addition, Dos Equis Lager and Ambar are being cross-promoted with partner brands, including 1800 Tequila and Cholula Hot Sauce, through instant and mail-in rebate offers. Dos Equis is also launching a 12-bottle Beers of Mexico variety pack in time for Cinco celebrations. The packs, which include Dos Equis Lager and Ambar, plus the Tecate and Sol beer brands, are now available in grocery and liquor stores.